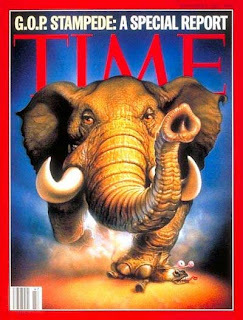 Heading into the 2010 elections, the Republican party is best characterized by its schizophrenic structure with a complacent political leadership and a radicalized populist grass roots movement. If the Democracy party acts like it's out of power even when it's in power, the Republican party acts like it's in power, even when it's out of power. And that is unfortunately rooted in the character of the Republican party as a conservative party, a party of the status quo, even when it can't figure out what that status quo actually is. In the wake of FDR's radical and extended administration, the GOP embraced the three piece suit moderate conservatism of Eisenhower, fusing conservative national defense policies with a fairly liberal domestic agenda. As a result the things that conservatives complain about, are just as likely to have been the work of a Republican President as a Democratic one. That is why despite the fact that since then America has been governed more by Republican Presidents than Democratic ones, the second half of the 20th century has been one long string of cultural and legal victories for liberalism... with setbacks happening only when those policies led to complete and unacceptable social disasters, notably excessive softness on crime and the welfare state. As the party of the status quo, the Republican party has not failed to roll back liberal cultural and political victories, but has repeatedly been complicit in legalizing them and perpetuating them. Which means that if history is any predictor of the future, even if Obama is forced out of office in 2012, his Republican successor will accept his policies and incorporate them into a bipartisan consensus, as has happened so many times. And that complacency is the secret behind the liberal takeover of America, it could not have taken place and cannot continue taking place without Republican collaboration. But the problem is not RINO's or Liberal Republicans-- rather it is the conservative worldview of the Republican party itself. Conservatism is naturally focused on conserving and preserving, it fights in defense of tradition and the way things are. The problem is that the situation in America has degraded too far and too quickly for the status quo to be worth defending. Instead the status quo being conserved is one that has already been crafted by generations of a liberal culture war against America. To actually make a difference, the Republican party needs to leave behind the armchairs of the status quo and become a revolutionary party once again. 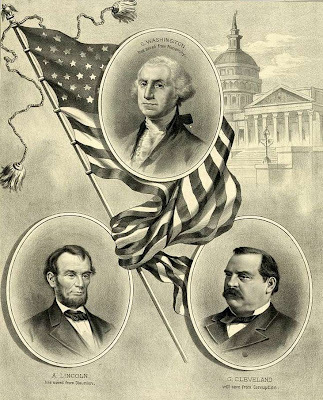 The birth of the Republican party took place against the background of a corrupt Democratic party that bound together international businessmen, immigrants and plantation owners into an oligarchy meant to crush individual freedom. In contrast to the urban sweatshops and rural plantations, the corrupt political machines and their gangs of thugs, and the whole Democratic ideology of Divide and Conquer by race and class so that the oligarchy and the political machines could profit-- the Republican party embraced an ideology that was both conservative, in that led back to the roots of the American revolution, and was at the same time revolutionary... Free Soil, Free Labor, Free Men. The Party of Lincoln did not only oppose slavery because slavery was wrong... it opposed slavery because only a nation of free people could rule a Republic, not slaves, serfs or servants. When Lincoln stated that the United States could not endure as a government half-slave and half-free, it was not simply a denunciation of the current state of affairs, but a statement that America could not survive if it becomes a nation of slaves, and thus a nation ruled over by despots. And yet that is the nation we are living in today. A slave does not have be property of a plantation owner toiling away in the cotton fields. He can just as easily be a college educated professional who nevertheless has as little practical freedom and property as the slave. There are many different kinds of cages and many different kinds of slavery, but they all have one thing in common, they are not free. Their labor, their rights and their land has been taken away from them. They are ruled over by masters and tyrants, supposedly for their own good, in reality to harvest the fruits of their labor for themselves. That was the political situation in the United States that the Republican party rose to confront, fighting a Democratic party rooted in slavery, whether on the plantation or the factory floor. And when the fighting was done and Lincoln was dead, his successors cut their cynical deals, and the United States continued drifting closer and closer toward slavery. The Republican party ceased to be a revolutionary party, instead in the 20th century it became a foil for the race and class warfare agitation of a reborn Democratic party that embraced socialism and turned its back on its own Jeffersonian traditions. Obama is not the first warning sign that the end is near, but he may be one of the last. There is still a window of opportunity for the Republican party to be reborn as a revolutionary party again, challenging the despotic status quo, the oligarchy of power and politics that the Democratic party has imposed on America. The Tea Parties and the Town Hall protests both signal that it is not the politics of the status quo that the people want, but a party that will stand up and fight for a free America. It is not enough to try and hang on to the legacy of FDR, LBJ, Carter and Clinton... against Obama. The idea of that is patently ridiculous and hypocritical, as if we are not for freedom, but only against change, and when enough time has gone by, then we grunt and accept the extra load. But that is exactly what the Republican party has been doing for some time now, bucking and kicking against every new piece of the socialist puzzle, while earnestly protecting and defending the pieces that have already been put into place. We have had enough of responsible Republican leaders carefully maintaining the prison walls that the Democrats have erected and continue to erect around us. What we need are leaders who will tear them down. We do not need new curators of every piece of legislative bric a brac, every byzantine construction of bureaucracy and every watchtower agency that the Democrats and their Republican collaborators have filled the country with. 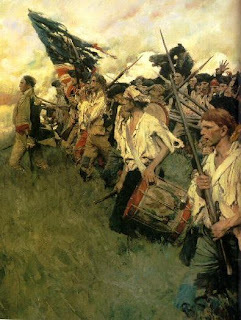 We need men and women willing to clean them away, to give away the power that they can wield through them over the American people in the name of American freedom, so that a nation with a government of the people, by the people and for the people, shall not perish from the earth. It's really up to Palin whether she can or cannot. Right now she has a limited window in which she can prove that she can take on a leadership role and defeat the media's image of her. The GOP needs to become the voice of the opposition, which means doing what the grass roots movement has been doing. And at the same time it needs to champion policies that will seriously reduce the size and influence of government over Americans through fiscal conservatism, fighting wasteful spending and eliminating much of what has been built up in D.C. since FDR's time. Unless the GOP becomes a real alternative to Obama, winning over independent voters will become much more difficult. There comes a time in the affairs of man when only a major event, such as war, can clean out the detritus of decades of sloppy thinking. This situation is certainly in the making in the UK. Good comment. It would be nice if we still believed as a people in the same ideals that we once did. We have so much wealth and so little time for others that I do not see a great change in us as a nation unless something happens to humble us. We all seem to be waiting on the edge of our chairs for a miracle to happen. There is no magic bullet that will get us out of our current situation. A major personal revision in our thoughts and actions as a people is the only way that we will find success, so I only see us digging ourselves into a deeper hole. I work for Footnote.com. As a history person it is my belief that people and their needs don't change, only the environment which surrounds them.